RAPAR is withdrawing from the Save The Family Home campaign. Our joint statement with Urban Expression Victoria Park is below. With deep regret and concern for the Farooqi family, our two organisations are formally and publicly withdrawing from this campaign with immediate effect. As we have consistently maintained, saving this particular family’s home from confiscation is in every homeowner's direct interests, and in the wider human rights interests of society as a whole; this has never been a single issue or a Muslim-only issue. To date, no legal decision is going to be made about whether the Farooqi family home should be confiscated or not until the outcome of the father’s (Munir Farooqi's) appeal against his criminal convictions; it is the appeal on his criminal case that is now centre stage. In our view, and based on our experience, campaigns that work hand in hand with campaigning and principled lawyers succeed. In this instance, it is no longer sustainable for our organisations to remain as members of this campaigning group. We will be maintaining a watching brief and will create commentary as and when we deem it to be appropriate. NB: The campaign page as it developed during this campaign is stored below. A Manchester family faces eviction from their home in Longsight. If the police are successful, a family with a young baby and an eight year old child will be made homeless, their home seized, and the proceeds of the sale given over the Magistrates Court. Father Munir Farooqi was recently convicted on terrorism charges following an undercover police operation. CDs and booklets were the only material evidence provided. Mr Farooqi’s son Harris, speaking outside the CPS Offices last week, said 'we believe a miscarriage of justice has occurred'. Campaigners handed over a 10,000-strong petition calling on the 'collective punishment' to be stopped. Harris, who lives at the house with his mother and other members of his family, and who was himself acquitted of a charge of preparing for an act of terrorism, said: “I have been through hell for the past two years. I cannot believe what the police are doing to me and my family." Nahella Ashraf, who is helping to co-ordinate the campaign, said "This is attempt to use legislation to seize a family home. It is not a coincidence that they are trialling this legislation by attacking a Muslim family in Manchester. If they are successful they will no doubt try to evict the families of people with convictions arising from the riots. That was the threat made when David Cameron recently visited Manchester." When asked whether he thought the campaign would win, Harris told Socialist Worker, "When a person has committed no crime he always wins". The CPS are soon due to decide whether to take the case to court for hearing early next year. The Save The Family Home campaign is at an early stage but already it has won support from local churches, mosques and the wider community. Click here to download a hard copy of the petition. Please print, collect signatures and return ASAP. Or, click here to sign the online petition. The ‘Save The Family Home’ campaign is to stop the collective punishment of the families of individuals convicted of crimes. 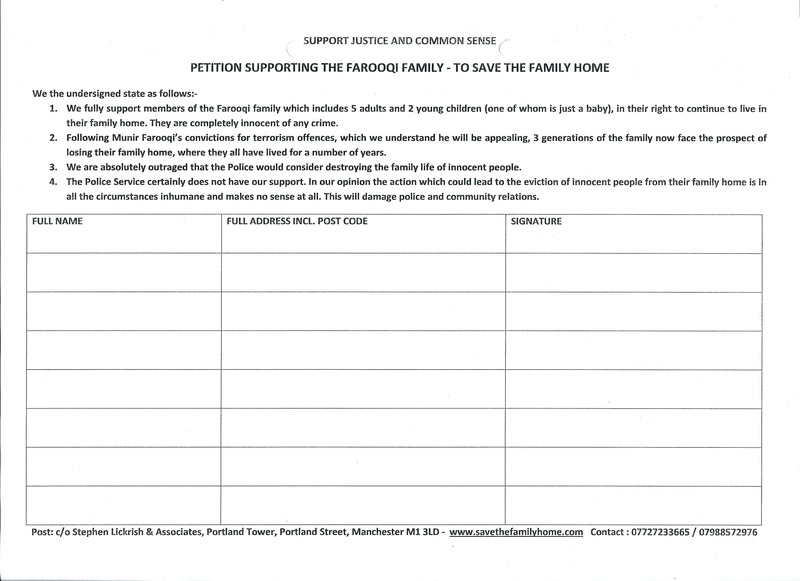 It has been launched in response to the Crown Prosecution Service’s threat to forfeit the home of the Farooqi family, who live in Longsight, Manchester. The family includes a seven-month-old baby and an eight-year-old child. The Farooqis have been told by the CPS that they may be made homeless as a result of Munir Farooqi’s recent conviction on terrorism charges. Mr Farooqi, the father of the family, although appealing against his conviction, is currently serving a prison sentence. However, the CPS is threatening to collectively punish the entire family by applying for a forfeiture order under the Terrorism Act. If granted, the order would enable the property to be sold and the proceeds placed into the Magistrates’ Court. It is very rare for families to face this form of collective punishment, and although it is part of the terrorism legislation it has never been applied in practice before now. We believe that punishing the families of an individual convicted of a crime is highly unjust. Munir Farooqi’s son Harris lives at the house with his mother and other members of his family, and was himself acquitted of a charge of preparing for an act of terrorism. He says: “I have been through hell for the past two years. I cannot believe what the police are doing to me and my family. So far the campaign has been petitioning people attending mosques in the Manchester area, and the police have now called the Imams into Longsight police station to discuss the campaign. No family members or other campaign representatives are being allowed to attend this meeting. The campaign believes that this is an attempt by police to influence the Imams against the campaign, thereby putting serious pressure on it to shut down. The campaign asserts the right to protest without police harassment, be it direct or by proxy.